Florida International University’s School of Architecture and the U.S. Green Building Council’s Miami-Dade Branch are proud to announce their first Eco-Couture Recycled Fashion Show! Designers will model their recycled outfits in a live runway. 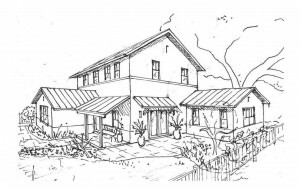 7:30 p.m.: USGBC South Florida Chapter’s GREENworking Event ~~ The only happy hour efficiently designed to build, strengthen, and sustain business relations. 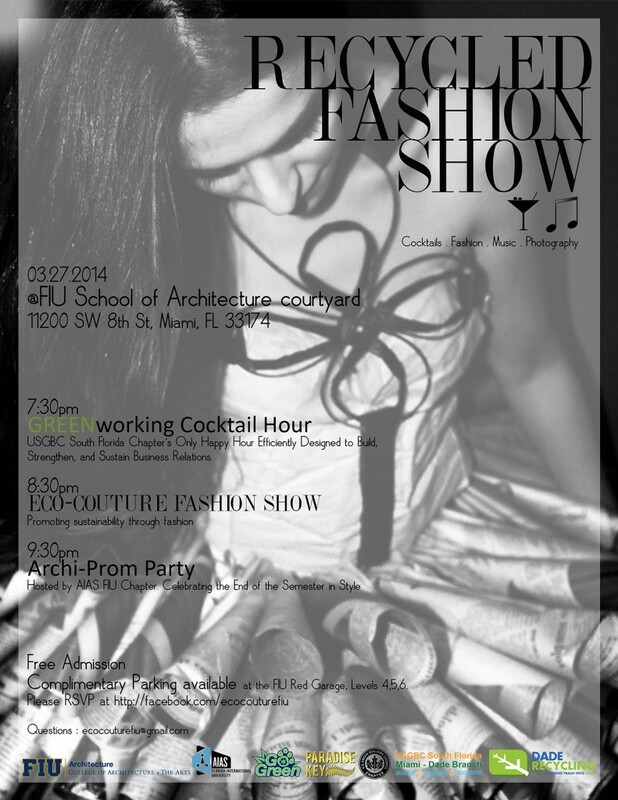 8:30 p.m.: Eco-Couture FIU Fashion Show ~~ promoting sustainability through fashion. 9:30 p.m.: American Institute of Architecture Students – Florida International University’s Chapter Archi-Prom after party ~~ celebrating the end of the semester in style. Complimentary Parking available at the FIU Red Garage, Levels 4,5,6. For further details email ecocouturefiu@gmail.com. On Sunday, the Little Gables Green Homes were wrapped in pretty green eco-friendly bows for the official ribbon cutting ceremony. Joining architect and developer at the event were his partners Jorge Milian of MDG Builders, and Richard K. Jones of Coltrain-Jones Architects. Also attending were Karen Shane, president of the Little Gables Neighborhood Association; Manuel Orbis Jr., special projects liaison for Miami-Dade Commission chair Rebeca Sosa; and Raul Valdez-Fauli, president and CEO of Professional Bank. The home at 4464 SW 11 Street is listed for sale at $625,000. 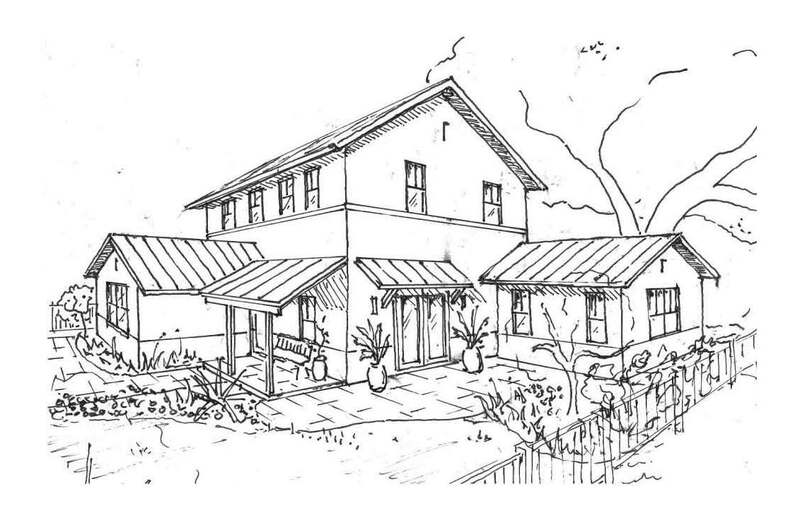 If you would like additional information about the Little Gables Green Homes, or any other green homes in the South Florida area, please contact me at 305.801.3133 or at MelanieinMiami@gmail.com. The City of Miami’s Office of Sustainable Initiatives presents . The 9 minute video gives “an overview of the sustainable Initiatives happening around the city, specifically as they pertain to urban development.” Jason Biondi, owner and sustainability consultant with Energy Cost Solutions Group; Pablo Gonzalez, Director of Sustainability at Arellano Construction Company; and Susie Glass, Executive Vice President Douglas Elliman Development Marketing discuss what Leadership in Energy and Environmental Design (LEED) is and why minimizing the environmental impacts of our buildings is so particularly important in South Florida’s fragile ecosystem. The video outlines the point system requirements to achieve the different levels of LEED certification, and showcases several LEED certified buildings in the City of Miami. Green Building Elements posted an article about the Vertical Glass House, built by West Bund Biennale of Architecture and Contemporary Art in Shanghai China. While I love the use of glass in architecture, I think I’d like a little more privacy in the bathroom. I’d also prefer my view to be the outdoors rather than the dust-bunnies under my bed. What do you think?